Four in 10 London nurses expect to leave the capital by 2021 because housing costs are so high, according to a survey by the Royal College of Nursing (RCN). Nearly four-fifths of the RCN members surveyed were worried about the cost of their accommodation. The RCN’s London regional director said essential services were at “breaking point”. Last year 17% of all London’s registered nursing jobs were vacant. Ben Morrin, the director of workforce at University College London Hospitals NHS Foundation Trust, told the BBC that hospitals initially offered subsidised accommodation to new staff. King’s College Hospital offers rooms in shared accommodation for £452 per month, including bills and council tax. A nurse’s starting salary (including 20% inner London weighting) is £26,030. But as staff settle down they are tempted by the lower cost of living outside the capital. “Normally we get to a decision point after two to three years when they want to move outside the capital, and the reputation of London’s teaching hospitals makes it easy for them to find jobs,” Mr Morrin said. One agency specialising in accommodation for NHS workers offers a single-bedroomed flat in Limehouse, east London for £1,350 – more than three-quarters of take-home pay on a starting salary. 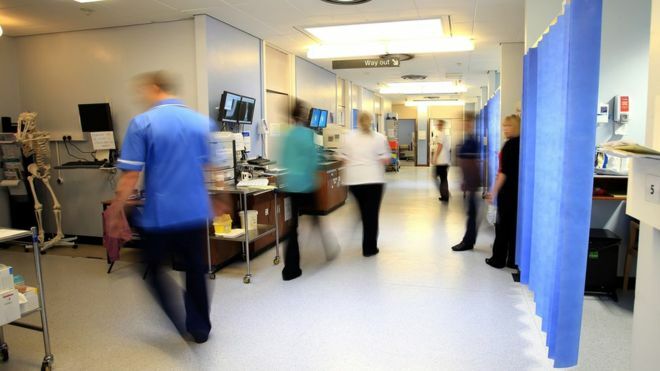 “With staffing shortages in London getting worse by the year, while patient need continues to go up, essential services are being stretched to breaking point,” said Bernell Bussue, the regional director of RCN London. The college is calling on the next London mayor to offer discounted travel for NHS workers, and require new homes built on NHS land to be offered first to low-paid NHS staff. Jo Yorston, until very recently an Emergency Nurse Practitioner in a major London hospital, said most of the nurses she was working with had moved so they could buy rather than rent and have space to start a family. “I worked with some very experienced nurses in my role – many with more than 10 to 15 years working in the NHS and on the top pay band for clinical nursing – and most of them have moved out.